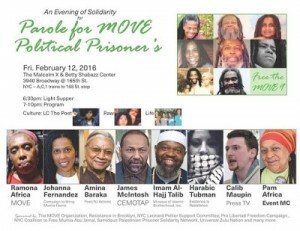 On Friday night, February 12th 2016 join the move organization along with all our friends and supporters in the NYC area for an evening of solidarity for parole for Move political prisoners. The program will be taking place at the Malcolm X Doctor Betty Shabazz center located at 3940 Broadway @ 165th Street. The main focus will be on the upcoming May 2016 parole hearings for Janet, Janine, and Debbie Africa. We hope to see all of you in attendance on this historic evening!